This is a sacred symbol of the Celtic goddess Epona. She is a horse goddess of Earth. Epona was invoked during the equinoxes (Autumn and Vernal) to bring about smooth passage of the seasons. These two seasons can be unsettling as they unfold upon the earth. As an overseer of the two equinox, Epona releases her power during these times to help insure easy transition during these times. Aside from being a notable Celtic goddess symbol, the double spiral also holds a profound personal meaning for mortals. Each end of the spiral expresses a polarity. For example: Left vs Right, Night vs Day, Death vs Life, Moon vs Sun, Good vs Evil, etc. The reality of polarity is perhaps one of the must crucial ideals in symbolic conveyance. Indeed, the entire universe is elegantly perched on polar or opposite energies. There cannot be a push without a pull. There cannot nighttime without daytime. Therefore, this double spiral is perfect symbol that portrays the balance between opposite influences. This month’s mandala encourages us to instill within us a sense of cooperative polarity, embracing our opposing energies both internally and externally. See it as a beautiful dance, back and forth, with one supporting and sparking the other and each other. When we restore and experience balance within ourselves, that balanced energy extends outward; it becomes easier to focus and notice when we start to go out of balance. And with this heightened awareness, we know exactly what we need to do next. A bit of a change with the Mandalas of the Month starting with July. In an effort to focus more on painting and creating mandala art and less on writing content, I’ll now be posting mandala designs that have been waiting in the wings, so to speak, to come into form. Throughout each month I’ll be painting them and posting my progress on my Mandala of the Day blog. 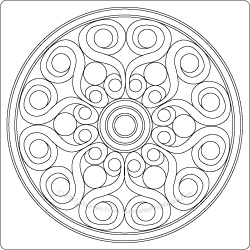 NOTE: The mandala will be free for you to download for one week, after that contact me about how to receive the mandala.